Researchers at Tomsk State University are excited by the new laser because it is multi-functional and has the potential to be used in a number of different spheres. For example the ability to cut bone and tissue with no side effects could prove revolutionary for the medical industry. The new device developed by the scientists is a strontium vapor laser and has the ability to operate at 10 to 12 different wavelengths, which researchers say is “exceptional” for vapor lasers, as it gives them so much versatility. 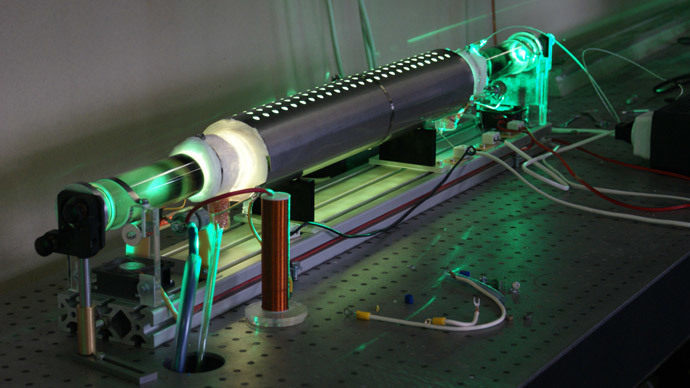 “There is no such laser anywhere else in the world, and there is a lot of interest in it,” said 73-year-old Professor Anatoly Soldatov, who is dean of the Innovative Technology Department, told the Siberian Times. He added that its optimum wavelength was 6.45 microns. Technology giant Samsung has already shown interest in the revolutionary lasers. The company’s electronics’ department had sent the scientists some glass samples to test with the strontium vapor laser and the results proved to be an eye-opener. Industrial devices normally used to cut glass for smartphones and tablets normally use carbon dioxide lasers at a wavelength of 10.6 microns. This laser does not actually cut through the glass, rather it heats it up. However, this process means that between 20 percent and 30 percent of the glass cut has to be thrown away because of defects such as chipping. “We have a multi-wave system that combines both surface and in-depth thermal detachment which results into a perfect surface. A study with an electronic microscope showed that the number of imperfections [when cutting glass with a strontium laser] is one-hundredth the size compared to cutting with carbon dioxide laser,” Soldatov told the newspaper. The scientists are now looking to perfect their technology in order to cut live tissue. They are also working to shorten the pulse duration to just a few nanoseconds, which will increase the energy density and thus its power. The development of lasers in Tomsk dates back over half a century, with the first one launched in 1963. Over the last few decades the university has produced a number of different lasers, including helium-neon, argon, carbon dioxide and nitrogen. Soldatov added that after the millennium, Vanderbilt University in the US became interested in researching a free-electron laser. They were trying to find a perfect wavelength for drilling through bone and the cutting soft tissues, due to its potential importance for research into transplants. “The first thing they determined was the best wavelength is 6.45 microns. At this wavelength it was possible to make good incisions and you can choose the mode in which the tissue charring practically does not occur,” he said. However, they were still looking for the best laser to carry out this task. They eventually got in contact with Tomsk State after coming across an old publication from 1983. Following some more tests, Soldatov realized that the strontium vapor laser was the most suitable, due to its ability not to induce any burning or damage while operational.